2015 BMW X1 - pricing, pictures, engines, specs | What Car? The new BMW X1 baby SUV is lighter and roomier, with a more rugged design and front or all-wheel drive. It goes on sale later this year priced from £26,780 to £36,060 and has been revealed at the 2015 Frankfurt motor show. 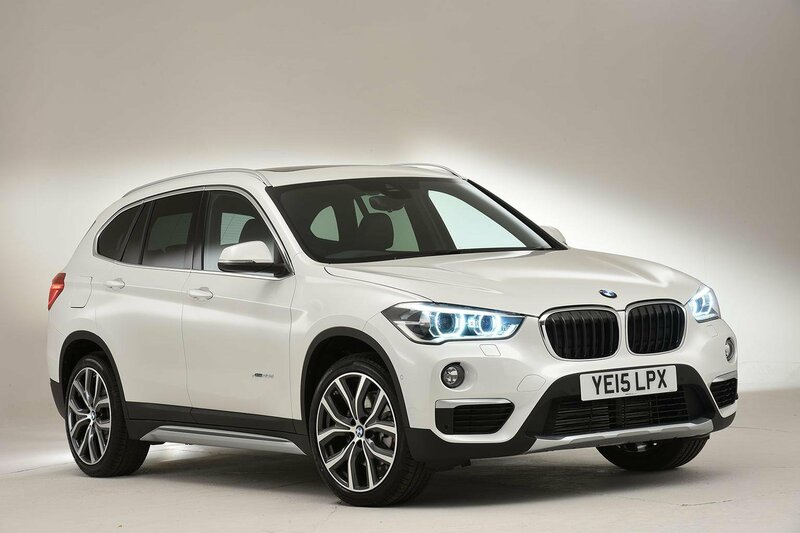 The new version of the BMW X1 is set to go on sale in the UK this autumn and is a rival to the likes of the Audi Q3. It has been comprehensively re-engineered and gets BMW’s the same underpinnings as the 2 Series Active Tourer and Gran Tourer. One of the most notable changes over the old car is the switch from rear-wheel drive to front-wheel drive on the lower-end models. Higher versions get four-wheel drive as before. The new X1 takes on a more rugged appearance than that of the model it replaces. It has a bolder front end, angular headlights with LED daytime running lights, round foglights, a contoured bonnet, prominent front wheel arches, extra cladding on its sills and increased ground clearance. It is 36mm shorter but 21mm wider and 53mm taller than its predecessor, at 4439mm long, 1821mm wide and 1598mm tall. It gets 37mm more knee room in the back, which increases to an additional 66mm with an optional tilting and sliding rear seat. Boot space has also increased by 85 litres to 505 litres, rising to 1550 litres with the rear seats folded. The X1 will be launched in the UK with a turbocharged 2.0-litre four-cylinder petrol engine in two states of tune and a 2.0-litre four-cylinder turbodiesel in three outputs. The petrol unit has 189bhp in the 20i, while the the xDrive25i is the fastest X1, with a 0-62mph time of 6.5sec and a 146mph top speed. The most economical model at launch is the front-wheel drive sDrive18d. It returns a claimed 68.9mpg and boasts average CO2 emissions of 114g/km. Final equipment levels have not been revealed, and will be confirmed closer to the X1's launch. However, BMW has confirmed that the entry-level model will come with a six-speed manual gearbox, while all other new X1 models come with an eight-speed automatic gearbox. This combines with the optional Driver Experience Control to offer a coasting function that disengages the clutch when you lift of the throttle at speeds between 31 and 99mph, as standard. All models receive brake energy recuperation, automatic stop/start and a optimum shift indicator. The first-generation X1 started at around £25,000, rising to £35,000, and the new model brings a slight increase in price. The new X1 is priced from £26,780 to £36,060, with the most economical sDrive18d model starting at £26,780, while the fastest xDrive20i engine costs from £31,225. The current model has Target Price discounts of between £2000 and £4000, and there are already some early discounts available through online brokers offering similar reductions on the new model.